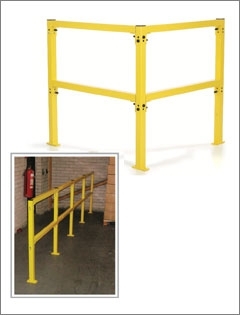 A highly visible safety barrier system designed for creating pedestrian walkways, dividing manufacturing units, stock areas, warehouse and commercial premises where for safety and other reasons segregation is required. Designed to be sited as individual units or in long runs. Supplied in KD form complete with fixing instructions. Posts are drilled through 4 sides to enable barriers to be positioned in straight runs or through 90 degrees. Ready for use, with the base plates conveniently pre-drilled for easy surface fixing. (Please note floor fixings are not included). Finished in epoxy powder coated bright yellow.